In 1952 I made my first microscope following instructions in a 1930’s edition of my fathers “Boys Own Paper”. Basically a thin strip of tin with a pinhole in it. Placed in that pin hole was a drop of water which formed a spherical lens. Peeking through that lens I saw a magical and hitherto invisible world. The scales on a butterfly’s wing, the cells in the skin of an onion. Then in a drop of pond water on a watch glass I saw tiny beings flitting to and fro with seeming urgency, if not purpose. So started a lifelong love affair with microscopes and the world they alone reveal. My dear mother Daisy, saw this love and at considerable cost funded my passion. A number of microscopes later I entered Sydney University to study Zoology and Botany and became an ecologist. 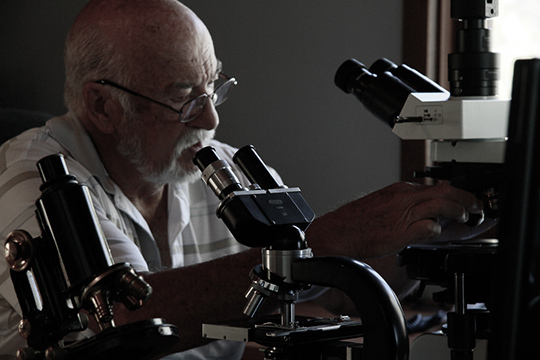 Now several careers later, retired and 72 years young, I am a passionate microscopist. In August 2013 With the blessing of my dearest wife Jin, I purchased my dream microscope, an Olympus BX53 with Differential Interference Contrast, Dry Darkfield Condenser an SC100 10MB camera and Cellsens Dimension software. I am also generously supported by: Olympus Australia and the University of Adelaide Centre of Microscopy, where from time to time I will be using their Gama FEI SEM. John S. Douglas. BA. MA. Sydney University 1970. Special thanks to Professor David Patterson for invaluable advice on the protists I can’t recognise and support in my studies. There are no limits, just obstacles to overcome with the help of friends. Previous Post Termite Symbiotic Protists & Prokaryotes – Stage one study.